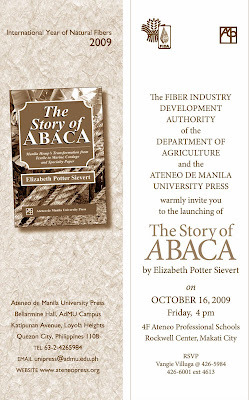 To celebrate the International Year of Natural Fibers this year, THE STORY OF ABACA by Elizabeth Potter Sievert will be launched by the Fiber Industry Development Authority (FIDA) and the Ateneo Press on Friday, October 16, 2009 at 4pm, at the Ateneo Professional Schools, 4F Lobby, Rockwell Center, Makati City. During the program, chemist and educator Sievert will present highlights of her meticulous research on abaca, while commentaries will be given by secretary of Agriculture Atty. Arthur Yap, FIDA administrator Ms. Cecilia Gloria Soriano, biotech expert Dr. Benigno Peczon, and industry representative Mr. Alexander Tan. THE STORY OF ABACA takes readers to old ropewalks of London and Salem, to mills of modern pulpers and papermakers, to abaca farms in Bicol and Leyte, and research laboratories in the country. Often called manila hemp, abaca is indigenous to the Philippines. It has unique properties that have allowed it to be used as clothing material of precolonial communities, heavy-duty ropes in galleon ships, paper products like envelopes, fine stationery, banknotes, and teabags, casings for sausages, as well as in car components to replace the costlier fiberglass. As papermaker and inventor Fay Osborne has said, more than half a century ago, "There is no substitute for manila hemp." THE STORY OF ABACA is available at the Ateneo Press bookshop (+632-4265984), and soon in bookstores.